You are currently browsing the archive for the Family Travel category. The Brú na Bóinne complex of three neolithic tombs (Newgrange, Knowth and Dowth) on a ridge in the middle of the Boyne Valley is perhaps the most-famous archaeological site in Europe, and Newgrange is its poster child. A side-view of Newgrange passage tomb. 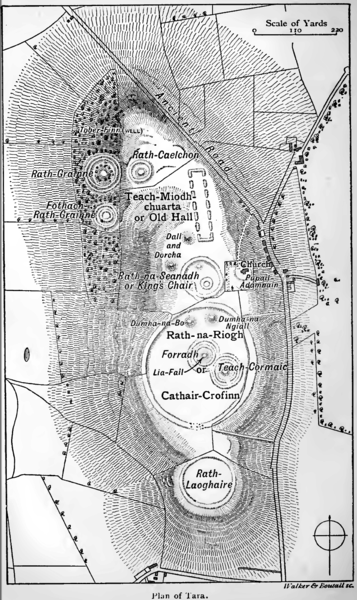 Most of the earthworks on the Hill of Tara are thought to have been dwelling or feasting places. A long depression runs up the hill from the road towards the Mound of the Hostages. The two sides are high, presumably man-made, earthen banks. This is known as the Banqueting Hall, and for years kids were told it may originally have had wooden walls and a roof. However, this interpretation may have been due to the existence of a seating chart for an ancient King’s banquet, and is likely a good example of people naming a feature to fit in with available relics. A more-likely explanation for this long earthwork is that it may be the remains of one of the five roads that were said to lead to Tara from the five corners of Ireland. It’s easy to see how it could have been a ceremonial entryway, with the high earthen embankments on either side, complete with “windows,” gaps that may have allowed views of significant local landmarks such as the Hill of Skryne on the other side of the Boyne valley, the various tombs of former kings, and possibly a few standing stones. Magnetic gradiometry and other non-invasive survey techniques have recently revealed the remains of a huge structure at Tara. Under the tall grass and several feet of dirt lies a deep ditch dug into the bedrock of the hill. The ditch runs in a circle around the site for about 170 meters (about the length of two football pitches! ), encompassing the Mound of the Hostages (and probably the original site of the Lia Fail as well) and the present-day church grounds. This ditch seems to have been surrounded on both sides by an enormous “fence” of huge wooden posts. Circles of wooden posts are not uncommon at this time (1200BCE) — remains of one much-smaller circle have been found and partially reconstructed nearby at Newgrange — but the scale of this one is off the charts. Interestingly, the “banqueting hall” appears to terminate directly at the edge of this ditch, perhaps suggesting the hypothesis that it was a road or ceremonial entryway is more likely. The exact purpose of this arena (or “woodhenge” as it has been dubbed) is unknown, but as it enclosed the burial chamber known as the Mound of the Hostages and then later the Christian church was built within its boundary, this would suggest it had deep spiritual significance to generations of people. It’s not known what, if anything, was placed on top of the wooden posts, but that hasn’t stopped fanciful artists depicting it as an Irish Stonehenge, with two concentric circles of wooden posts topped with horizontal wooden beams. It’s estimated that at least 500 immense (and old judging by the size of the post-holes) trees would have been required to provide the beams. One theory holds that the remains of deceased Kings and nobles may have been left to rot inside the arena. Once the flesh was stripped from the bones by decay or birds, the bones would be separated and interred within the mound of the hostages. There is ample evidence of this practice of defleshing a body before burial from elsewhere in the country. Another interpretation is that the aspirant King needed to make a circuit of the arena as part of the spiritual journey toward kingship. 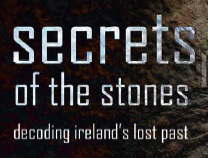 The RTE documentary Secrets of the Stones discusses The Arena on the Hill of Tara at length. 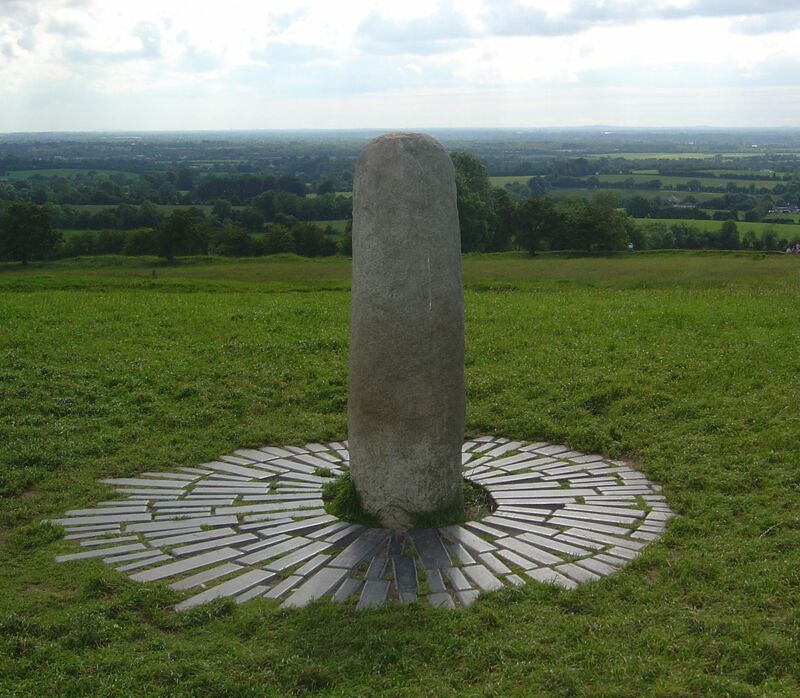 500 years later, around 700BC, an iron age ring fort — simply a large, thick wall of dry-stacked rocks surrounding a building or buildings — was built on the Hill of Tara. This was an advance over the old raths, which were simply a deep ditch with the earth removed and piled up in a bank behind. This represented the labor of many people working together to transport rocks from a larger area and construct the thick protective wall. By this point, the wooden posts surrounding the ceremonial ditch would have rotted away, and evidently the people of that time did not valued the structure enough to replace or maintain it, although the importance of the top of the Hill of Tara appears to have remained undiminished. This new ring fort was every bit as large as the fenced ditch, but surrounded the top of the hill more exactly (the ditch and ring of posts was on a slight slope). It encircled the rath of the kings and also reclaimed the mound of the hostages. In light of this series of constructions on the Hill which all incorporated the mound of the hostages, it’s obvious how important the inhabitants considered their ancestors, regardless of whatever changes occurred in their mode of worship. 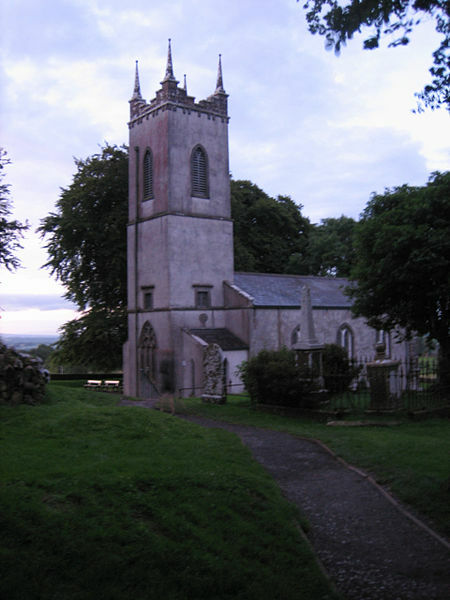 This is the final part of a series of posts about the Hill of Tara. 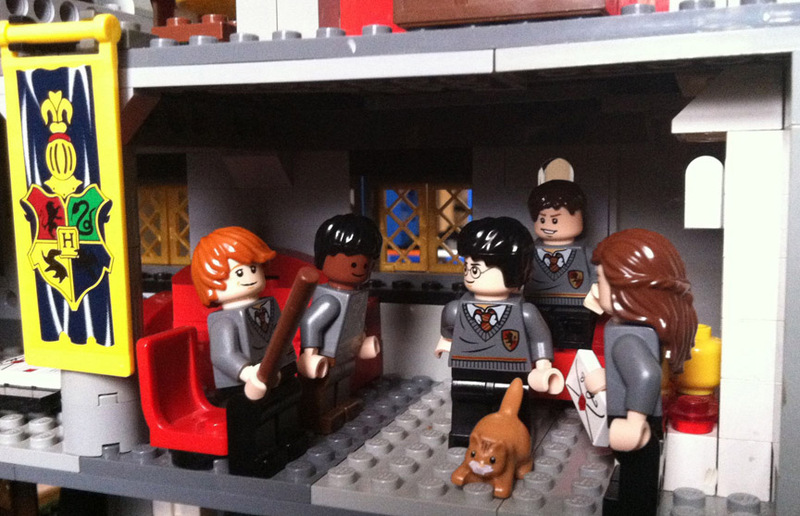 Expecto Legonum: Where Has All the Harry Potter Lego Gone? 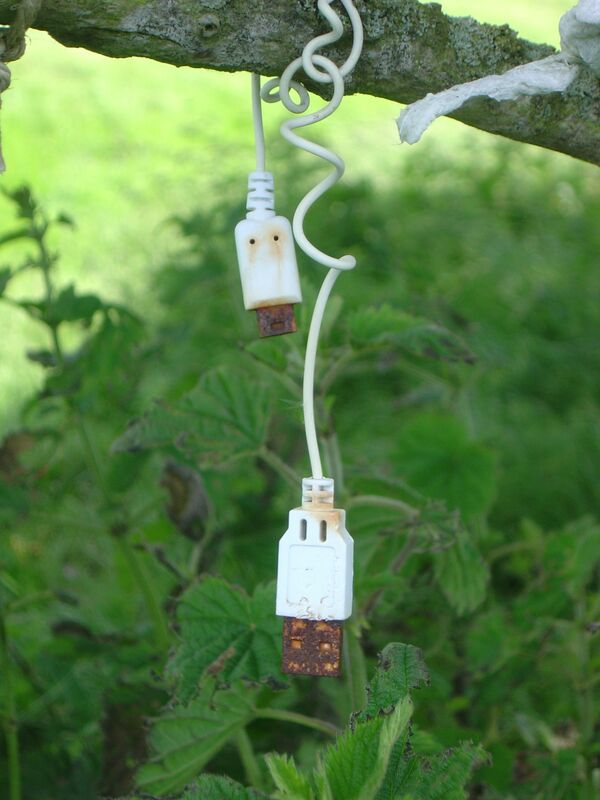 And How to Make Your Kids Happy by Finding it! My youngest child recently became a Lego fanatic (as am I). She was already enthralled by the Harry Potter books and movies, so the discovery that two of her favorite things were now combined (and just before Christmas, too) gave birth to a new obsession. Unfortunately, Lego stopped making Harry Potter Lego sets last year. Ron, Dean, Harry, Neville and Hermione wonder if Crookshanks has eaten Scabbers in the Gryffindor common room. Most of the remaining Harry Potter Lego sets were apparently snapped up in stores during the Christmas rush, and now it’s hard to find Harry Potter Lego sets at a reasonable price. (Evidently, it’s not a new thing for investors to buy up collectible toys like this, and resell them online for two or three times the price.) What’s a geeky Dad to do? I want to encourage creative play and nurture her individual interests, but the prices of these hard-to-find Harry Potter Legos sets are eye-popping! The Fat Lady, secret entrance to Gryffindor Tower. My daughter is young, but already computer literate enough to search eBay for Harry Potter Lego Sets. The prices for complete Harry Potter sets tends to be sky high (eBay prices are second only to the after-market prices on Amazon) — although you can find bargains if you pay attention. You might find a loose set (no box, most of the pieces) for 1/2 to 3/4 of the (after-market) price of the unopened box, but that’s still expensive (as they’re going for three times the retail price when in-stores) and slightly dodgy, as you don’t know for sure that all the pieces are there until you build the set. People also like to break up sets to sell the pieces individually on eBay, as they may make more money that way. The mini-figures are the most-valuable, some going for $40 each, even used! You might score a Harry Potter set for a (relative) song without any mini-figures, but your child might not be overjoyed, as the play value seems to depend on having the right beloved characters. Lego helpfully make all of their instruction sheets downloadable for free from Lego.com. (This doesn’t stop people on eBay trying to sell the instruction booklets for a good price, however. Buyer beware!) If you have a good supply of Lego bricks already, you could start by downloading the plans of a coveted Harry Potter set, and see how many of the pieces you already have. Probably most of them, but the colors might not be exact. But here’s the thing: don’t get caught up with being exact. Kids don’t let a desire for 100% accuracy get in the way of play. One of my daughter’s friends saw the multi-colored Hogwarts we built and exclaimed “A rainbow castle! How cool!” That reminded me kids aren’t as uptight as adults about collecting or having things perfect. A great source of individual parts (new and used) is Bricklink, an online network of stores who sell Lego piece by piece, as well as some complete sets. You’ll find almost everything cheaper than eBay here. You can also buy Lego Harry Potter mini-figures individually on eBay or BrickLink if those are what the kids are really in love with. While one Harry Potter figure might still set you back $15 plus shipping (at the cheap end), that’s a lot cheaper than buying a whole set. Again, figures tend to be more expensive on eBay due to the auction effect. You can also buy individual Lego pieces direct from the Lego.com. The selection is much less complete than Bricklink, but you can buy in bulk whereas sellers on Bricklink often have only one or two of each brick. You will not find specific Harry Potter mini-figures or “Hogwarts” pieces there, but you should be able to find many of the pieces you need to complete Harry Potter sets, and in the correct colors. The same might be the case if you live close to a Lego store (we don’t, so I can’t pop in and see what they have). Shipping from the Lego online store tends to be more expensive than BrickLink, so if you are only looking for a few parts bear that in mind. I got bulk quantities of windows, tan bricks, doors, and other various parts that look like they belong in the Hogwarts castle, and the shiping is much more reasonable once you’re ordering a larger amount of bricks. They often have special offers or free gifts with purchase, so you can find great value or get some exclusive bricks by ordering direct. Surprising, almost two years since I originally write this post, Amazon.com still have sellers listing complete Harry Potter Lego sets. Some are still quite expensive, but others look more reasonable once you’ve done your research and seen the much more expensive and complicated options out there. There are little stocking stuffers like the bagged Harry Potter in the Lab figure that are reasonably affordable, and larger sets like some of the Hogwarts sets (beware, there are several that make up the complete castle) and others with many unique and iconic pieces (such as the Quidditch Match set) easily available. In comparison to the more time-consuming sources, Amazon.com looks better all the time. My solution to ensure some creative Harry Potter-themed Lego fun without breaking the bank has used all of the above sources. First, I showed my daughter the downloadable plans for all the Harry Potter Lego sets which gives her great ideas, and helps her build approximations of them with our old Legos (we have tons, including a lot from my own childhood — one of Lego’s many virtues is that it’s practically indestructible!). 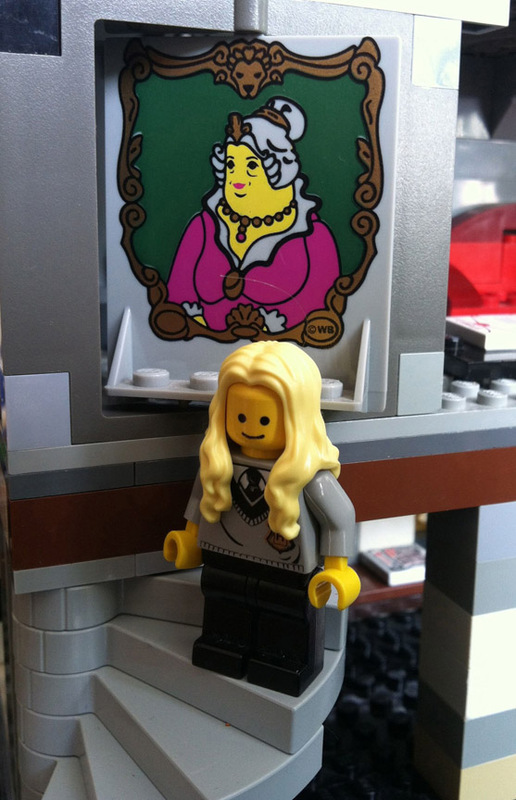 Then, I ordered some special parts and figures from Bricklink (spiral staircases, Gryffindor banners, the Fat-Lady’s portrait hole, chocolate frogs, etc. ), scored one small lot of mixed Harry Potter Lego pieces at a reasonable price on eBay, and found the rest of the pieces we needed on the lego.com site (where we got a free gift). I then left it up to my kids’ imaginations to build their own Hogwarts. The colors might be a mixed bag, but all their friends ooh and aah when they come over, and I haven’t heard one word of complaint. My daughters are obsessed with Doctor Who. Besides the show itself, they love the trading cards and magazines. It’s their latest obsession, and one I’m very happy to support because — unlike Japanese Erasers or Silly Bandz — I actually credit this with turning my youngest from a very reluctant reader into an avid reading machine. It all started with a trip to Easons this summer. I have fond memories of reading comics and kid magazines when I was a child, but the paltry few we have to choose from in the US are sheer drivel, and seem to have not a single redeeming quality. So, knowing Easons has the widest selection of magazines in my hometown, I took them in to see if anything caught their interest. After steering our youngest away from a predominantly-pink magazine with free chemical-laden make-up, she spotted an issue of Doctor Who Monster Invasion and decided that was her choice. 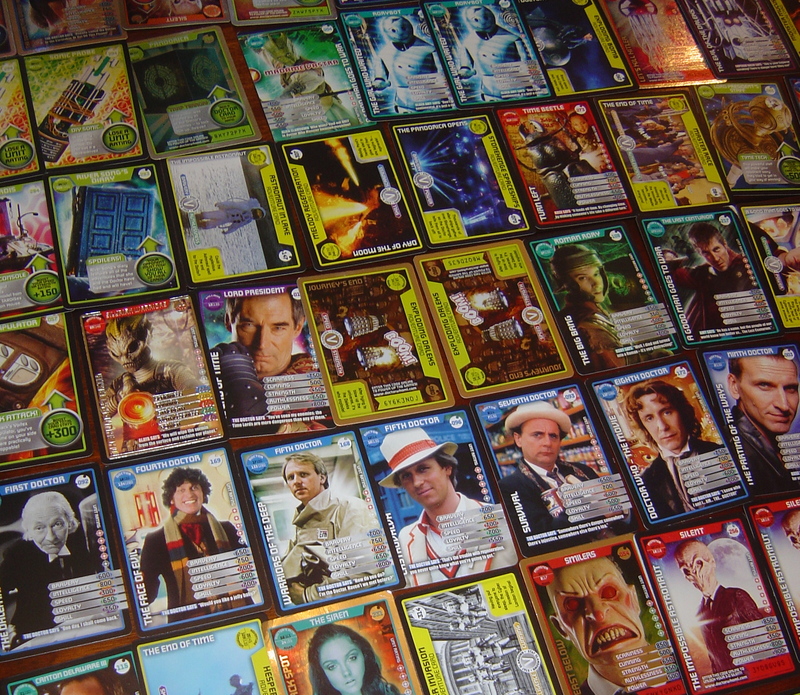 The magazine came with a pack of trading cards, and when they opened it in the car, it was infatuation at first sight. After we came back to NC, we took out a subscription to the magazine. The day the monthly shipment comes is drop-everything-and-read day — and there can never be too many of those. Cairn T, on Carnbane East, near Oldcastle, Co. Meath. The entrance is locked in this picture, but guides are present for much of the summer months. About 6000 years ago, construction began on a large complex of passage graves atop three hills near Oldcastle, Co. Meath. Known as Loughcrew or more picturesquely as Sliabh na Callighe/The Hills of the Witch, these are relatively small cairns (in relation to the famous passage grave sites at Brú na Bóinne), but what they lack in size they make up for in number (30), several of which feature carvings and contain triple (or cruciform) chambers. One of the largest, known as Cairn T, is illuminated by the sunrise on the spring and autumn equinoxes. The passage is very short, the back of the chamber a mere couple of meters from the entrance, but this tiny chamber is heavily carved, and the slab illuminated by the sun contains many enigmatic images and symbols. 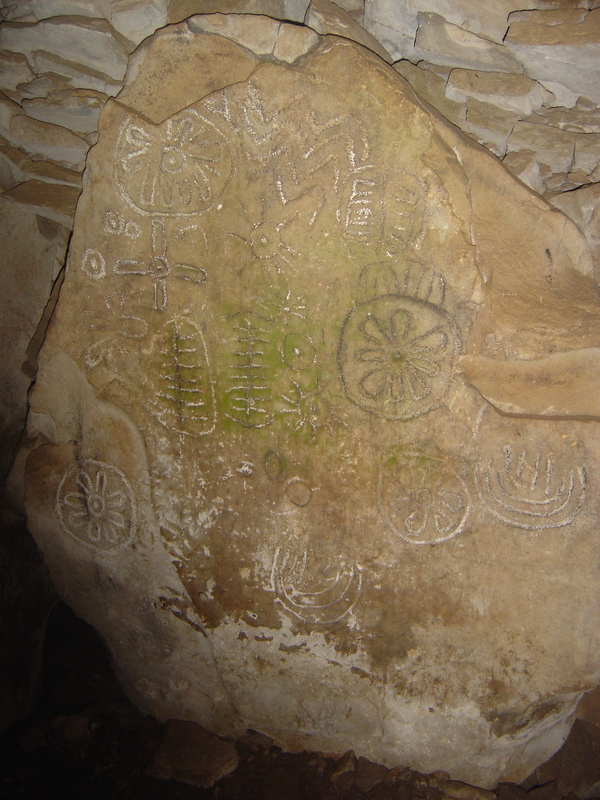 As well as the usual circles surrounded by rays (often thought to represent stars or the sun), and groups of semi-circular lines and various shapes (which some have suggested may be calendars or some form of scale) there are what appear to be child-like depictions of flowers and leaves, perhaps trees. Alright, that’s my own theory; but, given that the equinoxes represent the pivotal points in the natural cycle (spring for planting and autumn for harvesting) it makes sense to me. However, there are probably as many opinions as there are observers, so I’ll reserve judgement until I have a chance to watch the carvings emerge from the darkness with the sunrise on some future equinox. The rear of the chamber at Cairn T, in the Loughcrew complex in Co. Meath. Somebody seems to have used chalk to better outline the carvings, and the green may be some mold or lichen growing due to the damp conditions in the cairn. Today, Loughcrew is off the major tourist trail and definitely one of the lesser-known passage grave complexes, but it’s thought that at one time it was extremely important. 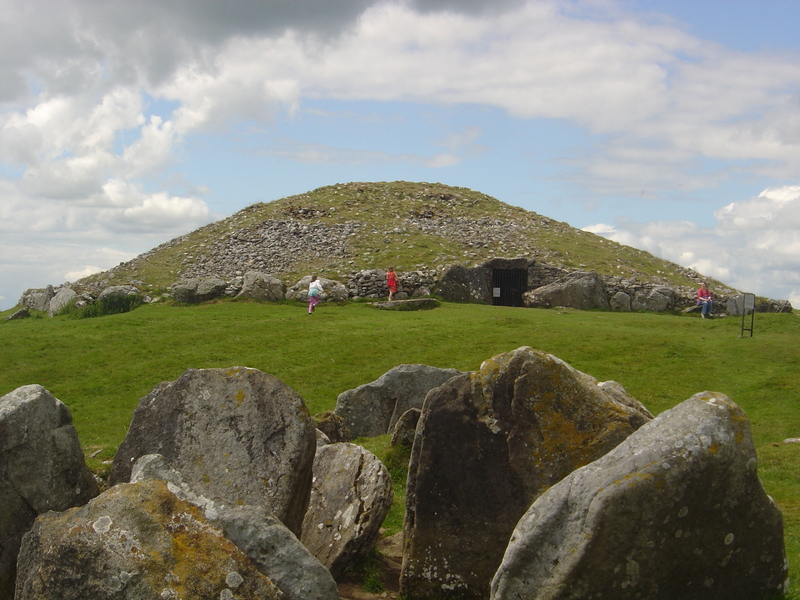 The hills on which the main cairns are located are called Carnbane East and West; in Irish, that translates as white-cairn. There are walls of white quartz running around some of the fields on these hills, stones that are believed to have been taken from the cairns when the English passed laws requiring the enclosure of agricultural land. As we’ve seen at Newgrange, some passage graves were covered with white quartz, which would have glittered in the sun and drawn the eye for miles around — in the same way that Renaissance Christians built cathedrals to inspire awe at first glance. Perhaps these tombs enjoyed a similar level of importance in prehistoric society? 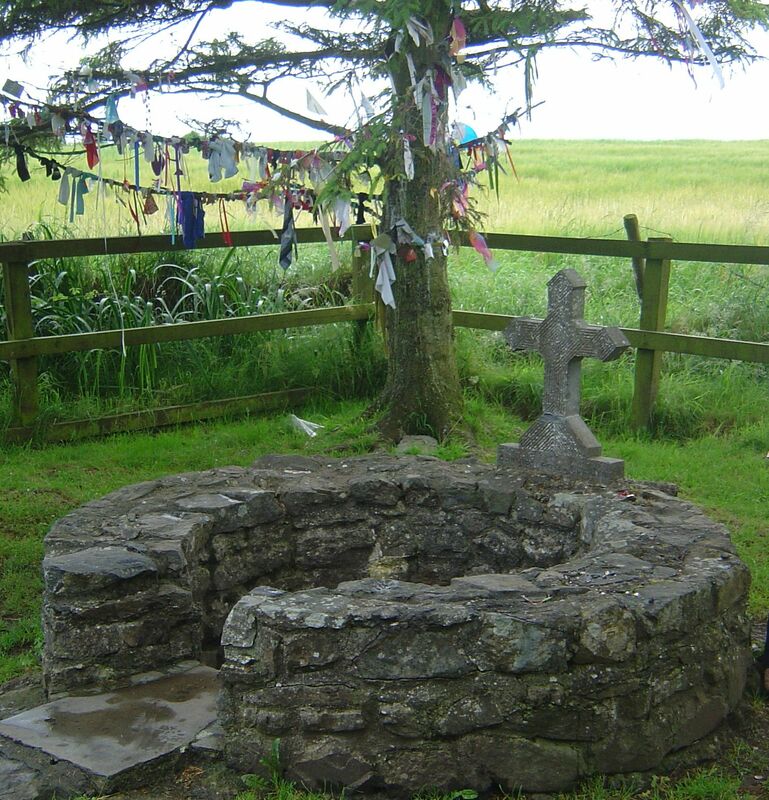 Cairn T is also known as the Tomb of the Ollamh Fodhla, the learned judge who codified Ireland’s ancient Brehon laws, and was presumably an important man who could conceivably have had his ashes interred at a significant site. The blessing of Loughcrew’s relative anonymity is that anyone can show up at sunrise on the equinoxes and watch the illumination take place. It apparently lasts for almost an hour, and as the rear of the chamber is clearly visible from just outside the entrance, there is no need for a lottery to get inside. 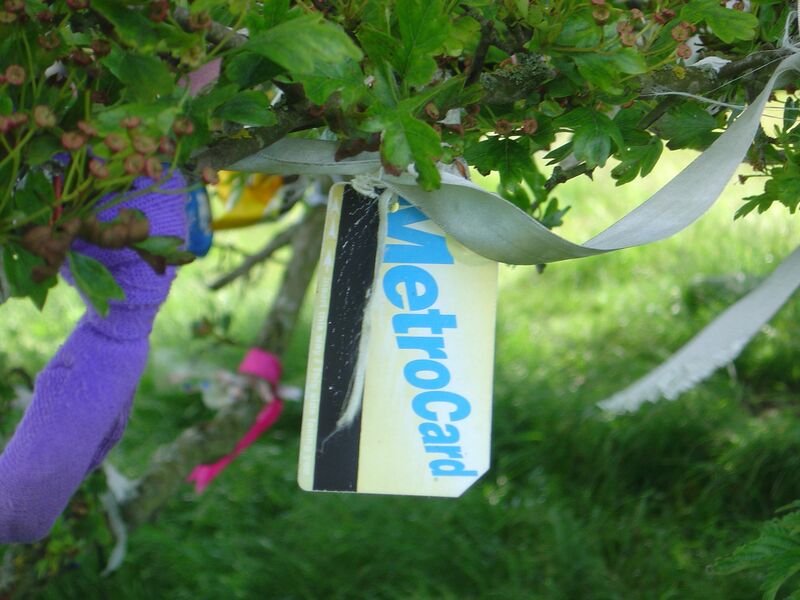 In the summer months, an official guide is resident on Carnbane East to admit visitors to Cairn T and tell them the history of the site. I hope whoever manages to be there for the equinoxes enjoys the show, and the rest of us can use the equinox illumination as a reminder that it’s time to get on with our planting or harvesting. Peter Jackson could have filmed the Hobbiton scenes around Dowth. It’s that beautiful. Dowth is one of the three tombs in the Brú na Bóinne world heritage site, situated on a slope rising from the river Boyne near Slane, Co. Meath. In contrast to the other sites at Brú na Bóinne, Dowth is not restored and beautified, but this is a plus as some feel Newgrange and Knowth are a little too well-manicured (and it seems fitting, given that Dowth is derived from Dubhbadh, meaning darkness). Also, access to the Dowth site is free and not controlled via the visitor center. After a morning spent being shepherded around the other two sites, everyone will revel in the freedom to explore Dowth and the ruined churchyard beside it on their terms. Newgrange as seen from the top of the Dowth mound. The mound is just off the road; a simple road sign points the way through an old iron gate. Like much of Ireland, parking is on the grass verge along the edge of the road. As you walk along the path towards the mound, the side of the mound that has been dug away is clearly visible. 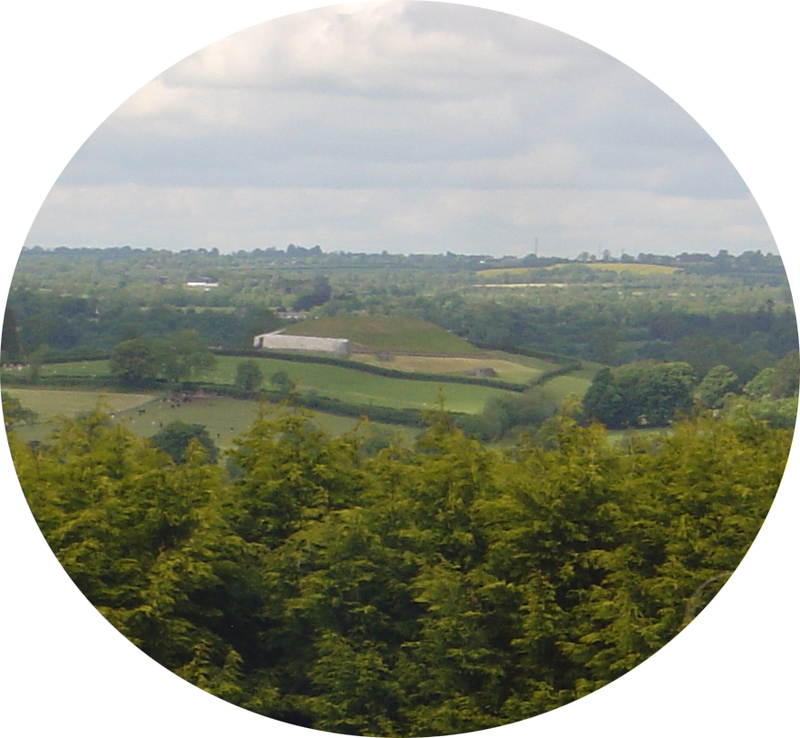 The rim of the mound remains in a horseshoe shape, and the views of the Boyne valley and Newgrange from the top are excellent. Children love to scramble up the mound — but beware of the thick clumps of waist-high weeds growing in the center; these are stinging nettles! As you walk around the site in a counter clockwise direction, you come upon two low stone-lined entrances, of a size better suited to sheep than humans. (In fact, you’ll probably share the site with sheep, as Dowth, although owned and managed as a heritage site by the state, allows the local farmers’ sheep to graze around the mound — a not uncommon arrangement given the vast number of ancient ruins in Ireland.) 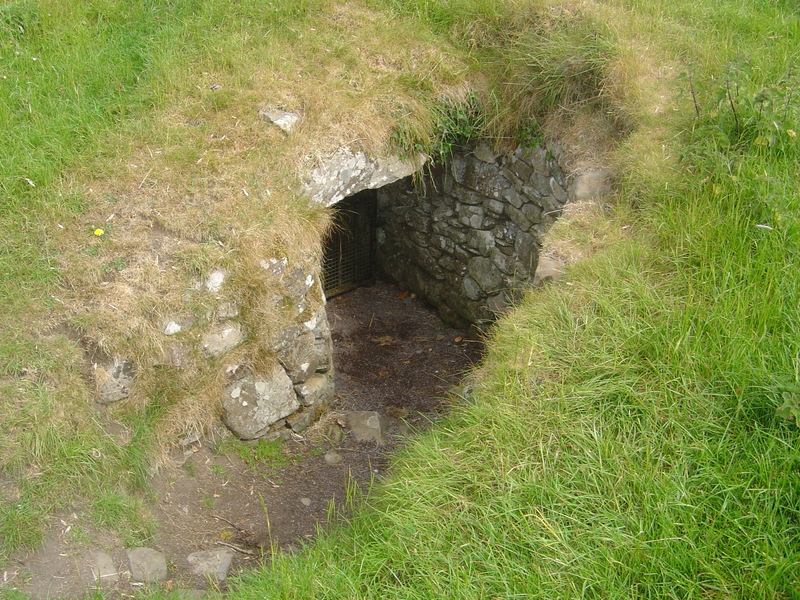 These are the entrances to the smaller of the two burial chambers. It’s rather unusual to find two separate entrances to a single chamber; perhaps this reflects a change in burial ritual during the building of all three monuments or perhaps one afforded entrance for people, and the other allowed the passage of the sun for some ritual reason? Unlike Newgrange and Knowth, which were built to allow people to walk more-or-less standing up, this passage is tiny, designed for crawling only. The chamber is a short distance from the entrance, and you should have enough light to see inside fairly well. Be sure to take a few pictures holding your digital camera , the flash will show detail you miss otherwise. This is one of those times you’ll be grateful you have a flashlight in your pocket. Like Newgrange, the South chamber is aligned with the winter solstice. However, a recently planted row of trees on the neighboring property are gradually impeding the sun, and will likely eventually block it altogether. At the back of the south chamber is a convex stone which is reputed to reflect the sunlight back against some carvings on the other side of the chamber. As the chamber is locked year-round, I have sadly been unable verify this phenomenon. It should be noted that the roof of this chamber had caved in — a legacy of the quarrying, maybe — and was rebuilt with concrete at some point in the past, so it’s not known how much later interventions has altered the precise layout of the chamber. The curious aspect about this chamber is that the setting sun illuminates it not just on the winter solstice, but from sometime in November through February. This suggests the sun alignment had some other purpose than simply celebrating the return of the sun at the solstice. Continuing to walk around the mound clockwise and you’ll see several large kerbstones peaking out of the lush growth at the base. It appears that Dowth originally had both a ring of kerbstones and was covered in white quartz rocks like Newgrange — now mostly removed for local building projects. 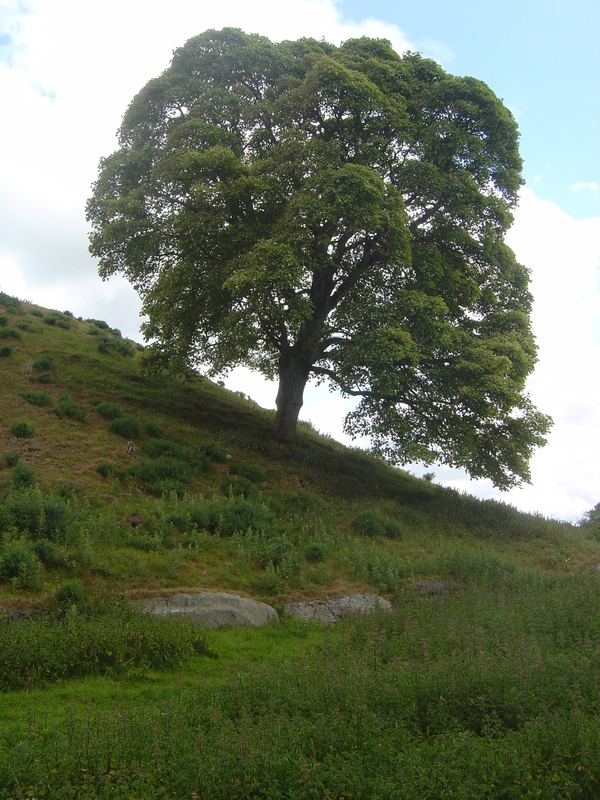 On the south side, you come upon a beautiful tree growing out of the slope of the mound. In summer, this looks like something out of the Lord of the Rings, and you half expect to come across a Hobbit hole just past the tree. Instead, you come across one of the most intriguing pieces of neolithic art in Europe, The Stone of the Seven Suns. 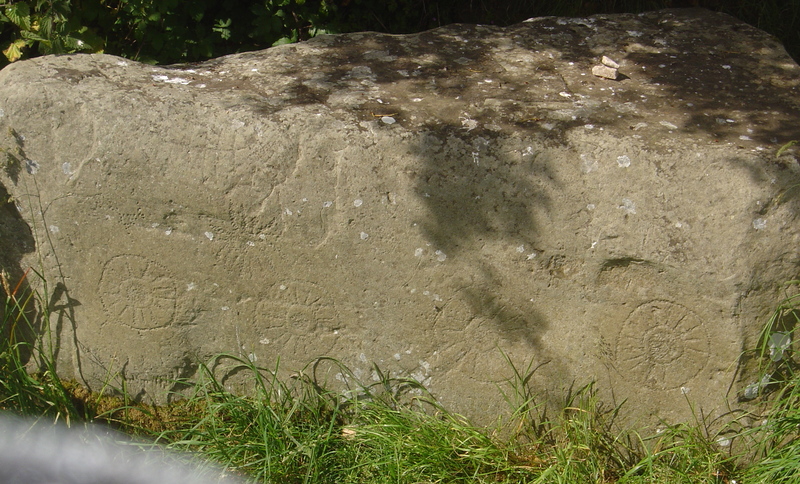 Although most of Dowth’s kerbstones are overgrown or buried, Kerbstone #51, known as The Stone of the Seven Suns, has had the vegetation stripped away to reveal what appears to be celestial notations depicting the sun, the moon, and stars. Whether this is some sort of solar calendar, a record of eclipses and celestial movement, or some kind of teaching tool, we simply do not know. One of the seven “sun wheels” appears to show a lunar eclipse in some detail. Significantly, this kerbstone is carved on both sides, suggesting the key to its purpose could have lain more in the act of its creation than in a means of recording or transmitting information. Then again, perhaps the kerbstones where simply an abstract means to beautify the site and please the gods or spirits of the ancestors, or maybe the images on the back were simply a design that went wrong — the chisel slipped and the stone was turned to save the effort of quarrying another? An indentation in the mound has been cut behind the kerbstone to allow people to see these mysterious carvings in full. (There is speculation that this indentation may conceal the entrance to another chamber.) Encourage your children to try to guess at the meaning of the various symbols; their guesses will be as good as anyone else’s. Across the field at this point, you will see the ruins of Dowth Church, destroyed during the 1641 uprising. A short walk across the fields brings you to the present day Netterville House and the ruins of the church. The history of Dowth is a fascinating blend of the historically important and the farcically eccentric. The tomb sits on what was once part of the estate of the Nettervilles, an old Anglo-Norman family. When the Insurrection of 1641 began, the then lord, Viscount Nicholas Netterville, allegedly first offered his services to the Crown, but when he (as a Catholic) was not greeted with open arms, he threw his lot in with the rebels. He lost his estates for his trouble, and saw the Dowth church and castle reduced to ruins, but ironically had his possessions restored a decade later when Oliver Cromwell came to power and recent enemies of the crown were recast as heroes. One century later, the sixth Viscount, John Netterville, built a gazebo on top of the Dowth mound from which he “attended” mass in the nearby church by telescope! In the 19th century, misguided amateur archeologists used dynamite to blow a hole in the mound searching for a fabled inner chamber they thought might contain the lost Ark of the Covenant. It’s not recorded whether these would-be Indiana Joneses found anything they could recognize after their destructive excavation. The heavily damaged site was then used as a quarry for stone for many years, until the mound was overgrown and forgotten. Oddly, while Newgrange and Knowth have been extensively excavated and restored, little appears to have been done to Dowth other than rebuilding the roof of the south chamber and securing the entrances to the chambers and souterrain. But the contrast between the decay and damage of the ages on one side, and the glorious (if controversial) restorations on the other gives an indication of the magnitude of both the achievements of the restorers and the artistic skill, engineering know-how and organization of the original builders. As you wander around the overgrown acreage of Dowth, you can draw on the insight gained at the Brú na Bóinne visitor center, inside Newgrange, and around Knowth, to fill in the blanks, to allow the mind’s eye to show you Dowth as it might once have appeared, and ponder what life at this bend of the river Boyne might have been like 5000 years ago.